Check them out on the link Below. Finally, here is my take on last week’s Welsh championships. Firstly, I decided to lift in the higher weight class to what I normally would have done, not having the best-off build ups towards this comp made me adjust a few things. Thinking back my training was based on weights that although I had done before I was not in that condition to do them at this point. Along with a few other points I needed to adjust some of hat was set out in the last few weeks. For me whilst I always work to a training plan there must be an element that can adjust a few things when needed to. So anyway, on to the comp like I said I went over my weight and was 76.6Kgs and that a was pleased with for a start, this weight was after breakfast and with a full belly from eating well all day before. So, Squats I had opted to open on 217.5Kgs for a comfortable start and then went on to do 230/237.5Kgs both being British masters 1 records. Tbh my last lift felt good and there was more in the tank. Bench well with an opener of 155Kgs and making hard work of that I went up 2.5Kgs for a far better lift I decided to have a shot at the British record with 160.5Kgs and today it was just too heavy and was not too be. Deadlifts went well and again comfortable opener on 225Kgs gave me a total and then I moved onto 235Kgs for a British Masters 1total record, my final attempt was 242.5Kgs and again a successful lift gave me the increase on the total record. So, all in all I was very pleased with the out come from the day 4 British records. 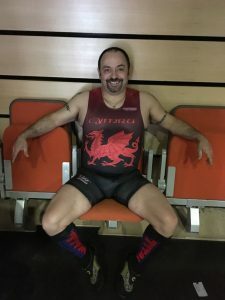 And, each lift set and reset the Welsh records in the master’s 1 Classic side of Powerlifting. The only part of this build up that was not changed was to compete Classic and that side I am pleased about the outcome. Now for those of you who may have noticed my sponsors Titan support systems have now done a Welsh National Singlet. And wow it turned out great, I was fortunate to have some input into the final design and it does look smart, well done to Titan for another class product. So, what is next then, Time to reassess my training and move onto the European Masters in July. Defending my title and hopefully do it with some good lifting. It will be back into the Equipped side and think after last weeks comp the fire is now burning and I was to bounce back with a good days lifting at this event. Classic training. Well basically mean no kit, over the last few weeks I have started to get some raw training in, working on a few points that I want to address. For me the main thing I do find with training without kit is the time scale. Normally my equipped squats would take me 2 hours to complete. Yes I do go slow but sometimes I just need to take my time. But no doing the same amount of working sets I can get through it in under an hour. Maybe even 45 mins and that’s going some. Fair to say that’s a big difference. So not only am I saving time in the gym I am able to get a fair bit more done also. While I do feel worked after each session I think using lighter weights will help me and after all it is not always about lifting big weights all the time. So anyway for now it will continue and hopefully my raw stuff will start to come back up a bit and to a tidy level again. Another thing I will say my body weight is still low and holding relatively close to my comp weight. Well fair to say after a little break from the gym the dreaded Dom’s have hit in and boy I can honestly say I have not missed you at all. It is surprising that I’m a few weeks you can go from lifting something g half decent to a weight that is far lower and feel like you have been hit by a bus. Suppose at this point it can okay get better is the phrase used quite a lot. Strangely though with regular training they disappear as quick as they come and then it is just the odd occasion they pop up again. So for myself it is nice to drop right back in weight and now I am in a position to take it a bit easier for a while now and get back to some raw training in prep for the year ahead. Think most off my ore lay off aches and pains are feeling much better and the training at a much lower weight will definitely help keep all them at bay. So with time now on my hands I am able to address a few points that I would like to see changed around and to things that I know I need worked on. So with this all in mind and some sort off plan worked out that other thing I want to add back is the cardio to help me with my recovery. It is something that I don’t really enjoy but I know I have to do it. Being fitter can only be a plus for myself and help me with the work load when I am lifting weights so I guess they go hand in hand really. So along with all this and my meal prep I am confident it will keep my body weight in check and close to where I should be and not up in the the high 70Kgs where I have been in the past, that is something I did not like and don’t want to be there again if I can help it. Don’t fancy being an 83Kg lifter at this point. Also I have changed the lay out off the blog and will have a little play about with it again and see if I can spice it up a bit. All the info is still here I just felt it needed a slight revamp after all it has been running in the original format for a while now. 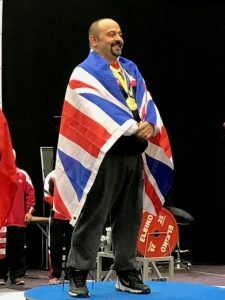 Afternoon people, for those of you who follow my blog may have noticed that I did not lift at the recent British Equipped championships. Well unfortunately the week before the event my youngest boy broke his arm. On the Thursday before the British he has his check up and the consultant felt the arm was not sitting right and would not heal correctly. The prognosis was on the Friday he would be operated on and recast then for some weeks. Fortunately, when he was put under for the op they managed to manipulate the arm rather than use pins at this point. I was so proud off the way Lewis handled it and even now a week after he has been great with the situation. So now my mini crisis is over it will be back to the drawing board and next up will be the Welsh Championships being held in Cardiff in April. This has now given me a chance to drop right back in weights and re adjust my training towards this event. There is some time now till the European masters and me having to defend my title in Czech Republic. It was a shame about the British, but these things happen, the world acclaimed #GBBO had to be postponed until the Euros now so Phil Frost you got your reprieve best get training hard for July. Can I say also a big shout out to Marc Giles and the Horncastle for running an amazing comp combining the Full power and Bench only equipped lifting. It is nice to see the equipped side coming back up in the numbers again. Here we are the end off 2017. Fair to say it has been a great year and at times like this it is nice to reflect on the tea that has passed. So what’s happened in my lifting career then that stands out most. Tbh I am not sure this year I managed to retain my IPF World and European Masters titles. And along the way gaining a bunch off individual medals as well as the overall ones that count a bit more. Then there was my Sporting Award from the Local radio for outstanding contribution to sport. That was something new this year and to win the first ever one was just fantastic. Again we have the British squat record I broke at the start off the year 312.5Kgs did an increase on my previous record by 1.5Kg. Strange to think that was standing for about 3 years and was also the current IPF masters world 74kg record at that point. Think it is fair to say that there have been a few things going in that went well for me this year. So what is next then in 2018 ? Well firstly we have the British championships in a few short weeks, this year it is being held in Horncastle and Marc Giles and his crew run a great comp there. It is at this comp myself and Phil Frost have a Bench off to see who can press the most weight there. You may have seen the hashtag #GBBO it had nothing to do with the bake off this time. Best off luck Frosty second is a good place to be. On that front my shoulders have started to feel back to normal and the weights are coming back up nicely so let’s just watch this space and see how the next few weeks go in the final stages off the build up for the comp. So as this year ends and another starts can I say a Big Thank you to My sponsors who are there Time and time again. So Thanks to you all for your help and support in all I do. So for now may I wish you all a Happy new year and may you all get your dreams in the year ahead. So here I am a bit late updating he blog but well what can I say the last few weeks have been busy and amazing at the same time. 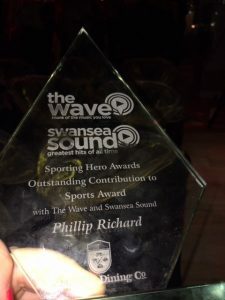 First and foremost, I was invited to a sports award winning the local radio station in Swansea. ‘The wave ‘had their inaugural sporting awards where people could nominate anyone for a whole range of awards. I was asked to go along and was so proud to be nominated for the outstanding contribution to sport……. Yes I won the award and was so amazed to do so. There was a whole host of sporting celebs there and to have some recognition for my years in the sport was amazing. Not only to win something like this was in my mind was fantastic for my sport and me it was great to be part of the first time this has happened. Powerlifting is slowly becoming more recognised and in main stream media. Now that the break is over it is back too the grind stone so to speak. It was nice to have some time off lifting weights and rest a bit. But like all good things it has to come to an end, so the planning has started for the British Equipped champs and next year it is earlier and will be in January. Horncastle is the venue and they are going to combine it with the Equipped Bench. The last training cycle a few things changed and not really for the best if I am honest. So some careful thinking and planning for the training ahead and try to make amends on what areas I know have gone wrong and need to be addressed. So with training in mind I think it is also back to food prep, for me the biggest thing with the prep side is having the ideas for what to make and to keep the meals varied a bit more than I have done so far. On another note I have been shortlisted for a sports award in my home city off Swansea. Next week they have what the call the sporting hero awards and I will be there. It looks like there has been several nominations or me and it is an honour to be though off that way. Hopefully I will have some more news on that front after the event. So here is the late update on the IPF World Championships in Sweden. Well the outcome was I retained the World Title. Firstly, I will say Sweden is always a great place to compete in. 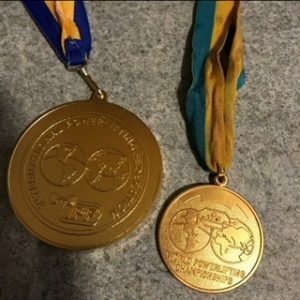 I won my first World title in Nassjo Sweden in 1989 as a 52Kg junior lifter many moons ago. So here is my run down on my lifting, bodyweight was slow coming down in the week up to the event but like always it dropped, I was just under the class weight. The biggest hurdle I will say was the early morning lift off. It was 8am our time and for me it was unheard off lifting weights at that time but then it is just part of the way things must go. My opening squat felt good and then I jumped to 300Kg for my second. After losing the grove on the lift I had to retake it again on a third attempt and I got that lift with some to spare also, just a shame I messed up the second. Onto the bench and in the run up to the comp I had been having some issues with my shoulders, after my second attempt I had done a comfortable 207.5Kg I decided to try 222.5Kgs for a shot at the European record. Not sure just how close it was but I felt pleased with the try at that weight. We went on to the deadlifts and the early start was starting to hit me and I was flagging a bit now after my opened of 235Kgs I was well in the lead, I did manage to pull 245Kgs and it was all I could do on the day, I did try more but failed it and as I said I was worn out at this point, wonder if it was old age or the fact off the early morning. Can I say Thanks to Frosty, Jim Mutrie and Steve Wall for their help in the Warm up room loading and keeping me on track. The medals went as follows Gold Squat, Gold Bench, nothing on the deadlift and Gold overall, I also managed to pick up the Runner up in the Best lifter awards for the Masters 1. Can I say a big Thank you to the people who have supported me, Firstly Nrg Fuel, Titan support systems. 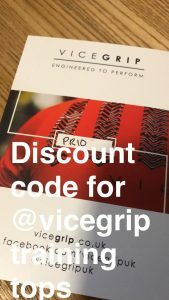 Vicegrip. Vale Europe Ltd, Unison Union and finally my secret sponsor who has asked not to be named for his financial help for this trip.